COPYRIGHT (C) 2017 BY LYNN JOHNSON, PH.D. PLEASE REPRINT AND SHARE this 870 word essay. 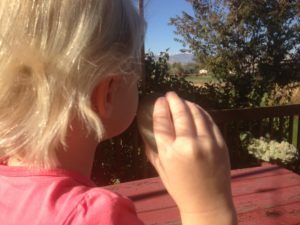 My three year old granddaughter has a passion for collecting rocks. She is not particular. The rocks she picks up and takes home have no apparent unique qualities. But love is there. Discussing her hobby I learned she can talk to the rocks. I asked her what the rocks say. Rocks sleep. Mountains rise and fall, seas wash over and retreat, and the rocks sleep on. Until they wake up. In Mexico this year, the rocks awakened and buildings were destroyed, lives were lost, and rescuers and their deeply perceiving dogs came and searched for suffering survivors. When rocks awaken, we all suffer. Winds doze and play, until one day when the sleepy winds awaken and howl and hurl themselves against water, earth, and us. Our buildings crumble and fail and rescuers arrive with tools and compassion. They never come as quickly as we’d like. A colleague felt we were slow to help those in Puerto Rico and indignantly asked how we would feel if we were cut off, our power and roads disrupted. I posted a reply. I said, “I would be fine. I have food enough for me and my neighbors. I have water enough for me and others who need help. I have ways to cook food without electricity or gas.” My connection said, “Well, aren’t you holy!” I replied that of course that is true, but I am also extremely humble. I believe in safety. I believe in preparation. I believe in sharing. A woman on the thread criticized me, saying what I proposed wouldn’t work for Puerto Rico since many people are poor. We cannot expect poor people to prepare themselves for what might happen. After any disaster, safe water is at a premium. How much does it cost to collect two liter bottles, clean them and fill them with culinary water? I bought two fifty gallon blue barrels that were formerly filled with syrup. I cleaned them and filled them with good, safe water. They were inexpensive, but they did cost something. If I were desperately poor, the discarded two liter bottles would be happy to help me, thrilled to find new purpose and meaning. If I were poor and a hurricane disrupted everything, wouldn’t I feel rich, sharing one of my repurposed two liter bottles, filled with pure potable water? Jesus said, “I was thirsty and you gave me drink.” Rich indeed. There is a saying: “When you need help in seconds, the police are just minutes away.” At least ten minutes. Maybe thirty minutes. Three days without water and you are in desperate trouble. When you need water today, FEMA is just days away. Maybe a week. I am sure I can go forty days without food; almost any American can, but having clean water to drink and something warm in my stomach brightens my outlook. The greatest happiness comes not from entertaining myself and owning material goods. It comes from sharing what I have with others. If I have something to drink and eat, my neighbor is next. Those who serve others who are in need feel deep inner peace and joy. In an emergency, it would be an honor to share water, food, and fellowship with neighbors. If you have a stack of firewood and some cast-iron Dutch ovens, you can make bread and bake beans. Nothing fancy, but warm and filling food, giving the disoriented and distressed consoling comfort. I have wondered if I could tell God jokes. My dilemma is that I think He already knows the punchlines. An insightful friend told me that if I want to make God laugh, I should just tell him my plans. Our plans reflect our expectation of the future. We assume that everything will continue just as it has from the dawn of time. Thomas Cahill, in his book, The Gifts of the Jews, argued that in ancient Sumer, in ancient Egypt, time was circular. Man invented nothing; unchanging life was a gift from the gods. Everything would continue as it always had. Then God calls, and Avram says “Here am I” and God sends him into a new land. Time shifts from circular, what is done is what has always been done, to linear. The future will be nothing like the past. In linear time, big things happen that change everything. Noah rides out a flood. Avram becomes Abraham. Moses returns Israel’s children to their home. Goodbye, Egypt’s fleshpots. Hello, Milk and Honey. Really good post! Water preparedness is essential.